There are 35 species of petunias and more than 400 varieties and named cultivars. To get the most from your petunias, you need to know a little bit about the most commonly available petunias. I love petunias, I plant a lot of them every year. They are perfect for full sun, bad soil, good soil, garden beds, slopes, window boxes and containers. They are easy to grow and quickly overflow whatever space you give them. You can find petunias in just about any color you want, bi-colored, single flowered, double flowered, mounding, spreading or spilling. In short, there is a petunia for any sunny spot you want to fill. But every year that goes by there are more to pick from, making it more difficult to choose. I realized several years ago I had to start paying attention to all the new varieties and figure out their good and bad points to get the most out of my petunias. There are two primary classes of petunia and all petunias found today are hybrids. Grandiflora means large flower and Multiflora means many flowers. Additional horticultural types or classes include Floribunda, Milliflora and Spreading petunias. But so many new varieties and hybrids have been developed, that some have created a class of their own, like the ‘Wave’ series petunia. Each of these new series of petunia has been improved in at least one way or another that can affect how a petunia performs in different situations. Grandiflora is one of the original petunias developed in the early 50’s. They produce the largest of the petunia flowers, but the blooms tend to get mushy from rain and watering. Planted where they are protected from rain, Grandiflora creates stunning huge blooms. The blooms can get 5 inches in diameter and can be single or double flowers. There are fewer blooms produced by the grandiflora petunia, but the size of the blooms makes up for numbers. The huge blooms make grandiflora one of the most popular petunia type. Grandiflora are usually upright and mounded in form but some are cascading. The mounded form can get 15-24” tall and up to 36” wide. They love moderate or cool summers and not too much moisture and humidity. Only water grandifloras enough to keep the soil moist and not saturated, and wait to water until the soil is dry. Mix a 10-10-10 fertilizer into the soil as directed when planting, and apply again at about half rate mid season. If you are using a liquid fertilizer, apply every 4-6 weeks. Too much fertilizer will encourage foliage growth and reduce blooming. Pinching the stems back an inch or two after is becomes established but before flowering begins will encourage a bushier plant with more flowering. Removing faded blooms will also encourage more flowering. The grandiflora petunia will not do very well in hot humid regions, but some new varieties have been developed that overcome some of the problems with the grandiflora. Grandiflora Petunias can develop virus that are often encouraged by moist conditions. If you notice deformed or damaged plants, remove all damaged parts quickly and do not dispose of the infected plants in your compost or leave lying on the soil. Grandiflora Cascade and Supercascade Series Petunia bear huge blooms from 4-5” in diameter for big impact. Also available as an improved double flowering that flowers earlier and are more compact and weather resistant than original doubles. Deadheading and pinching will keep the plants fresh and floriferous. Propagated by seed. Grandiflora Daddy Series Petunia blooms are beautifully veined and ruffled. Flowers early with 4” diameter flowers that have good weather tolerance. Growth and blooming are dependable, reaching 10-15” tall and 10-12” wide. Propagated by seed. Grandiflora Dream Series Petunia is free flowering and quick to bloom with a compact and dense form. Dreams petunias grow 10-15” tall and spread to 12”. The flowers are at least 3” diameter. A great variety of colors are available including picotees (bicolor). Dream petunias are quite tolerant of cold wet weather. Propagated by seed. Grandiflora Flash Sweetunia Petunia are compact and very floriferous. The bright blooms are “flash” orange, intensely red tinged orange. The plant is somewhat spreading growing 8” tall and spreading 18-24” and is heat tolerant. Propagated by seed. Grandiflora Frost Petunia are picotees with white halo and a range of vivid bloom colors. The blooms are 3 1/2 “ diameter with ruffled edges. The plants grow to 12-14” high and spread 14-16”. Propagated by seed. Grandiflora Hula Hoop Petunia is a picotee in bright colors with a white halo. It is early flowering and heavy blooming. The flowers are 3” diameter and the plant has a nice compact habit, growing to 10” tall and wide. Propagates by seed. Grandiflora Storm Petunia produces nicely weather resistant continuous blooms. Blooms are large, 4” in diameter. Performs unusually well after wind, rain and overhead watering. The plant grows to 14” tall and wide. Propagates by seed. Grandiflora Ultra Petunia produce large 4” blooms that are weather tolerant. Nicely branched plants with great color choices that include bright stripes and the hard to find sky blue. The plants grow 12-14” tall and spread 14-16”. Multiflora petunias were first developed in the late 40’s and introduced in 1953. They have smaller flowers than grandiflora, about 2 inch diameter. The flowers are produces though in greater numbers, still literally covering the plant. But the flowers are much more tolerant of rain and watering. Multiflora are also available in single or double flower varieties and perhaps the widest range of colors. Multiflora has a compact growth habit and generally need less pruning and pinching than the multiflora. They grow slightly faster than a grandiflora. They are tough and resistant to drought and petal blight, and they perform well in adverse conditions. They will continue to flower through heat or wet periods. Multiflora petunias will also benefit from pinching back which will encourage a more compact and fuller plant and even more blooms. I have seen multiflora petunias proclaimed as “a much better choice” for gardens versus grandiflora, but that depends on your situation and what you want. The multiflora are better for large planting areas that are difficult to maintain with pinching and deadheading. The flowers will hold up better in exposed planting sites. But the grandiflora are stunning in large windowboxes and containers, overflowing and spilling out everywhere. With the many new varieties of both multiflora, grandiflora and hybrid mixes, you will be able to find just the right petunia for your planting site and personal preferences. Multiflora Carpet Petunia is free flowering with mid size blooms. The plant grows 10-12” high and spreads up to 15”. Carpet petunias have a good heat tolerance. The color range available includes bicolor stripes and the flowers are 2- 21/2” diameter. Propagates by seed. Multiflora Easy Wave Petunia is actually a multiflora, but commonly considered a Spreading petunia in the Wave Series. See below. Multiflora Horizon Series Petunia is very rain resistant. It grows and flowers quickly and is a heavy bloomer. Flowers have thick sturdy petals that are 2 1/2-3” in diameter. The plants are upright, reaching 12” tall and 12-15” wide. Great garden petunia with a nice color selection including the first yellow petunia. Propagates by seed. Multiflora Merlin Petunia has good weather tolerance and a compact growth habit. Rain resistant flowers are 2 1/2” in diameter and blooms continuously. Wide color selection including picotee. Propagates from seed. Multiflora Mirage Petunia produces large blooms for a multiflora with a broad color range including picotees and stripes. The plant grows 10-12” high and 10-12’” wide. Propagates by seed. Multiflora Primetime Petunia has good basic weather resistance and disease tolerance. Primetime are vivid in color or brightly striped with white. Flowers are 2 1/2” in diameter. The plant is compact with a uniform growth habit, reaching 10” tall and 10” wide. Propagates by seed. Multiflora Tidal Wave Petunia is actually a multiflora but commonly considered a Spreading petunia in the Wave Series. See below. Floribunda petunias are a product of hybridizing between the grandifloras and the multifloras. Basically an improvement on the multiflora petunias, floribunda produces larger blooms just as abundantly as the multiflora. Like the grandiflora they bloom early but are more tolerant of poor weather conditions than the grandiflora, holding up nicely through rain. Floribunda petunias are improved enough to use throughout the landscape and gardens or containers, and put on a lush floral display. The new floribunda class was first introduced as the ‘Madness’ series. Both the growth habit and flower size fall about in the middle, but the floribundas benefit from an increased disease resistance. A floribunda F1 petunia will combine the best performance of grandifloras with the great garden performance of a multiflora. Floribunda Celebrity Petunia are not only free flowering in wet weather, but offer one of the widest range of color. Flowers are nearly 4” in diameter. The plants grow to 8-10” tall with a compact plant. The Celebrity Ice series are distinctively veined, the Star series have dark star shaped centers, and there are also picoteed, bicolor blends and stripes, as well as yellow, salmon and sky blue. Propagated by seed. Floribunda Madness and Double Madness Petunia are well branched plants that grow 10-15” high and 10-12” wide. Flowers are 2 1/2” diameter. The color availability is excellent including distinctive contrast veining and throat, stripes, picotee, peach, yellow and everything from white to midnight. Propagated by seed. Floribunda Pretty Flora Series Petunia is a Ball Seed exclusive that displays improved branching and disease resistance. The plant grows 7-10” high and 8-12” wide. Colors are bright basics. Wave Series Petunia is actually a floribunda but commonly considered a Spreading Petunia, see below. 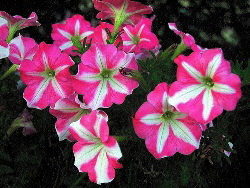 Milliflora petunias came to be from a genetic mutation of a petunia hybrid. The result was a true miniature, or dwarf plant usually no larger than 8 inches tall and wide. The flowers are nicely scaled to the size of the plant, only about 1 1/2 inches in diameter. Flowers are produced nonstop and completely cover the plant. Milliflora bloom quickly and early and require no pinching or pruning to encourage continuous blooming. The plant is very compact allowing for excellent use in small containers, window boxes or as filler plants. The Milliflora grow and flower quite quickly. No pinching is necessary. Many gardeners have referred to Calibrachoa and Million Bells as mini petunias, the are not petunias. But they certainly look like petunias and are cared for the same. They are excellent for spilling out of containers and window boxes just like the Milliflora petunias. Milliflora Fantasy Series Petunia are compact as well as dwarf. The plant remains neat and uniform without getting gangly. Fantasy is very floriferous and performs very well in most conditions. The flowers are around 1” in diameter and the plants grow to about 8-10” tall and 12” wide. Excellent petunia not only for containers but also for garden edging. Propagated by seed. Milliflora Picobella Series Petunia are a very vigorous and weather tolerant petunia, improved over the Fantasy series. The plant has a spreading habit that is perfect for massing in beds or on slopes, and in large containers. Grows 6-10” tall and spread to 18”. Propagated by seed. Milliflora Shock Wave Series Petunia are the earliest flowering spreading mini. The plants are blanketed with small blooms. The slightly mounded and spreading plants reach 7-10” tall and can spread as much as 30-36”. Shock Wave are heavy feeders and should be fertilized weekly in containers, less often in the ground. Propagated by seed. Tiny Tunia produces flowers just over an inch in diameter in a good range of colors. The plant is compact reaching only 6-8 inches tall and wide, perfect for small containers, window boxes or combined with other plants for colorful filler.. Propagated by seed. Other named cultivars including Baby Duck Yellow. 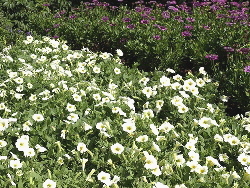 Spreading petunia are a relatively new breed that spreads like a ground cover. 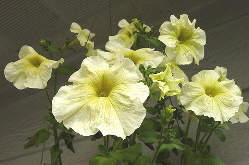 The spreading petunias are sometimes referred to as Trailing or Hedgiflora. They are very vigorous in growth and health, producing long trailing stems. The spreaders are typically only about 4 to 6 inches tall and spread in varying lengths depending on the variety, the Wave series petunias can reach 5 feet across. Flowers are produced along the entire length of the long stems, and blooming is prolific all season long with no pinching or pruning. The flowers are 2-3 inches in diameter and hold up very well in both heat and humidity. The spreading varieties are excellent for hanging baskets, containers and window boxes, as well as for covering large areas or slopes with sweeping waves of nonstop blooms. Cascadia Petunia are compact bushy plants that are wonderful for containers, hanging baskets or a groundcover that creates a blanket of 2” blooms. Cascadiea is heat and drought tolerant and will hold up through light frost. The plant is 4-6” high and spreads 12-24”, slightly shorter and narrower than the Wave. A good range of colors are available as well as bicolor, blends and picotee. Propagated by cuttings. Easy Wave Series Petunia are more mounded than the other wave petunias. Easy Wave will flower early in short days. The plant grows to about 10” tall and 3 feet across. These are a better choice than Wave for smaller containers or small gardens. Flowers are 2 1/2-3” in diameter. Very good color selection with unique plums, shell pink, corals and bright burgundy. Propagated by seed. Petitunia/ Dreams Series Petunia are a small scaled semi trailing petunia wonderful for smaller hanging baskets and window boxes. They grow vigorously and flower early, holding up well in heat and bad weather. The plant reaches about 12” high and 12-24” wide, shorter and narrower than the Wave petunia. Propagated by cuttings. Supertunia Petunia produce 3-4” diameter flowers. They are shorter and narrower than the Wave, reaching about 3 feet across. A broad range of flower color is available in vivid brights, pastels and blends. Supertunias are heavy feeders and should be fertilized weekly with a water soluble fertilizer when grown in containers. A slow release fertilizer can also be mixed into the soil at planting time, but they will also need continued fertilization. Propagated by cutting. Surfina Petunia produce interesting bloom colorations with vivid picotee, blends, pastels and brights. Some varieties have distinctive veining. The flowers vary by variety from 1 1/2” to 3”. Surfina petunias are often shorter and narrower than the Wave and Supertunias so they are more manageable for smaller spaces. The plants grow 6-10” tall and 2-3’ wide, but some of the improved varieties can trail 4 feet or more. Propagated by cuttings. Wave and Double Wave Series Petunia are actually a floribunda and undoubtedly the most widely popular spreading petunia. The Wave petunia is the original “Spreading Petunia”. The plants are only about 6” high and spread to 3 or 4 feet or more, flowering in pinks and purples. The Double Wave with frilled double flowering blooms spreads to about 2 feet. Double Wave flowers in reds, purples, pinks and white. (And now there is Cool Wave pansy!, a cool season bloomer that grows 6-8” high and spreads 24-30”.) Wave petunias are heavy feeders and should be fertilized weekly with a water soluble fertilizer. A slow release fertilizer can also be mixed into the soil at planting time, but the Wave petunias will also need continued fertilization. Propagate by seed. Tidal Wave Series Petunia is a spreading multiflora petunia sometimes recognized as a “hedgiflora” that provides a dense ground cover. The plant is about 10-20” high and spreads to 3 feet. Masses of 2” blooms blanket the plant. Available colors are purple-pink, cherry, pink and silvery pink. Propagates by seed. Whatever variety of petunia you select, you can count on non stop blooming all season long with minimal care and attention. Plant petunias where they will get at least 6 hours of sun, the more the better for most varieties. In hot regions some afternoon shade will benefit all varieties.. In part shade your petunias may get a little lanky, meaning long stems with less blooms along the stem. But they can still produce quite a lovely display. Allow the soil to dry slightly before watering. Fertilize petunias about every 2-4 weeks if planted in the ground, more in poor soil, less in rich soil. In containers the nutrients are leached out with water so they need much more frequent feeding, weekly is best. Double flowering petunias will need to be fertilized a bit more frequently, perhaps every 1 or 2 weeks if planted in the ground. Pinching back the stems by as much as half by season will cause the stem to split and thereby produce more flowers since they are produced at the end of each stem. The milliflora and spreading petunias need no pinching since flowers are produced all along the stem. Problems with petunias are not particularly common nor are they very often devastating to the plant. But if you can head off potential problems by knowing what to look for your petunias will be vigorous and beautiful. Petunias do not tolerate frost, so take care not to plant too early. In protected sites like windowboxes and near a heated structure this is usually not a problem. Iron deficiency can cause chlorosis (yellowing or loss of foliage color), use a fertilizer with iron. Boron deficiency can cause distorted or mottled foliage, terminal bud abortion and prolific lateral shoots. Botrytis is a fungus that creates a powdery mold on the entire plant. Cool moist conditions encourage the fungus, so avoid overhead watering whenever possible and don’t crowd petunias when you plant them so they have good air circulation. Rain “wilted” flowers on new varieties will recover in a few hours after the rain, so don’t worry about them. Grandiflora flowers may need to be deadheaded after a rain. Whiteflies and flea beetles can be a nuisance in some regions, damaging leaves and flowers.